Our upcoming European departure from Tràpani, Italy in early December reminded us that the most difficult times of the traveling year aren't slogging up the steep mountain passes or battling wind and rain, but the off-bike stages at the beginning and the end of the season. The special demands of the start and finish of a trip make it a tense time for many travelers, but it is especially difficult with bikes. Whether the bikes are being hauled to or from home or being stashed overseas, they are a burden. Storage is difficult to find if we leave them and securing boxes and packing is demanding if we travel with them. Our most meticulous planning of the year is for these several-day transitions between being cyclotourists and normal travelers. We now occasionally fly the budget airlines within Europe and their great prices come as the result of endless games. Bill ordered his ticket online with no extras for the flight from Tràpani to Dusseldorf and apparently didn't meet some minimum charge, as a vaguely worded 3€ fee was tacked onto his ticket. We paid the additional charges for a checked bag and priority boarding with my ticket and I incurred no such fee. The budget lines baggage limits are tight, which caused us to drag our luggage down to a nearby Sicilian pharmacy to pay to weigh our 1 checked and 2 carry-on bags on their scale the day before flying home this year. We were within the limits by a hair, so there was further shuffling between the 3 bags at the airport to stay under the limits. And the 33 lb limit on checked bags meant paying extra attention so as not to burn-up too much of our limit in the weight of the luggage itself. Extra scrutiny online and very careful planning is essential with these guys but you come out a winner if you can play their game. The new and always-changing airline restrictions on gels and liquids in carry-on luggage now adds another layer to the planning. Checking a bag solves that problem, but the budget lines charge for that privilege. And just remembering to remove all those non-allowed items we carry with us all the time, like hand cleaner, touch-up sunscreen, a pocket knife, and a can opener, add to our suitcase-traveler commotion. Not being able to take water through security means remembering to carry a bottle to fill at the restroom as the budget airline will charge on board for even a sip of water. Our time wrapping up the biking season in Tràpani underscored that the ordinary stresses for most people are now extraordinary for us. That needed shift to being on a precise time schedule encroached on our days and followed us into the nights. Lives where approximations are good enough for months on end suddenly had to become exacting. The daily uncertainties in our cyclotouring lives are generally limited to finding groceries and lodging at the end of each day. The uncertainty level of these issues is usually effectively dealt with by keeping track of local holidays, making flexible route plans, and budgeting extra time for problems. But as we prepared to shift into "suitcase mode" in Tràpani, our ability to corral uncertainty evaporated. 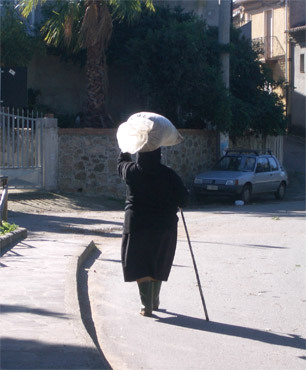 Normally straightforward tasks like coordinating with public transportation from town to the airport was made difficult by the foreign language and the culture. Our first layer of anxiety was triggered by the airlines using 1 name for our departure airport and all the local literature referring to it by a totally unrelated name. The pressure was on to get it right as our airline served both of the nearby, regional airports. It took too much time online to finally locate a single reassuring cross reference of the names, something we hadn't been able to satisfactorily get by asking the local folks. Getting clear about the bus schedule to the airport was nerve wracking too. The tourist info woman insisted on reading the schedule to me in rapid Italian, rather than showing it to me. After much prodding, she let me look at it, but I couldn't have a copy. Still not confident that all the possible sources of error had been ruled out, like the schedule being different on Saturday, I asked at another tourist office. They had no schedule at all and gave me the phone number for the airport and said to ask them about the bus. While listening to the automated menu in Italian that did not include ground transportation, I noticed another listing for the bus company. Of course, I couldn't get through on that line for hours and then the conversation was in Italian. And, as we've come to expect, there was no schedule posted at the stop. The "I think we've got it straighten out" on the airport name, the bus schedule, and which side of the road to wait on still had me tense. For an all-or-nothing event like catching a plane, I like to have a higher level of confidence than I had. And it was a morning flight, so heading-out hours early to resolve major glitches wasn't an option--we had to get it right the first time. The day before our departure from Tràpani, I noticed what might be an airport bus stopped down the street from where we were picnicking in a pocket park.. I dashed off mid-sandwich, hoping to talk to the driver before he took off. I was in luck, as it was his brief layover point and he was obviously accustomed to information-deprived, panicked foreigners. He kindly reviewed the schedule with me and confirmed that we were at the stop that moment . I'd now gotten the same information 3 times and trusted it was correct. In addition to the departure details, we'd looked forward to using our hotel's pay-to-use wifi system to wrap-up other lose ends and settle some of the uncertainty online, but it wasn't working when we arrived. "Tomorrow, tomorrow my colleague will fix it" Bill was told. Tomorrow came and by noon the colleague had given up. Bill went to the internet shop, which was locked though the "Open" sign was out (a common trick at Italian tourist info offices). He found a second shop as it was closing for siesta. He went back at 4pm and neither internet shop was honoring their posted afternoon hours. So, at 6:30 the night before departure Bill finally returned to our room, having made hotel and train reservations in Germany he'd hoped to make 30 hours prior from the comfort of our room. As I watched my background level of tension gradually creep higher with each ebbing and flowing incident before our departure to Germany, I realized it was the uncertainty factor that was stressing me. Our reservation at the hotel wasn't honored as made when we arrived; the man who agreed to store our bikes 2 weeks earlier appeared not to remember the conversation when we returned; the airport name ambiguity was ridiculously hard to untangle; the bus schedule shell game was maddening; and other little events all kept ratcheting up the uncertainty level. Even 2 hours before our flight, we'd still have uncertainty about 3 key issues. I tried hard to apply all the lessons I knew for quieting the mind and calming the body, but it was a challenging time for my nervous system now unaccustomed to this much high-stakes uncertainty. Along with our other stress management techniques, we established a new bedtime routine, which was to review our successes for the day. Usually one goes to bed with the unfinished business on their mind and this was an effective technique for displacing that negative mind chatter. But it wasn't until we had cleared security and were sitting in the waiting room at the airport that I felt the days of accumulating stress drain out of my mind and body. We had the right bus information, we were at the right airport, the electronic tickets were in order, we were able to make the weight limits on our 3 pieces of luggage--the ambiguity was suddenly gone and it was a wonderful feeling. And fortunately I was able to recognize that it was unnecessary to transfer this package of anxiety onto our next air leg in our journey home. Our next legs would all be within Germany, not southern-most Italy, and they would not be uncertain. The language would be a greater obstacle for me, but the cultural-overlay of challenges would be gone. We would make the train trip from Dusseldorf to Frankfurt with confidence, not uncertainty. We knew there would be no confusion about which airport to go to or how to get there. And the there would be no tension around our luggage because of the more generous weight limits on the transcontinental service. Our recent flight would have us up to speed on the carry-on restrictions. Unlike the high level of uncertainty surrounding our flight north from Sicily, our travel within and from Germany would be a smooth operation, like on a factory floor, and we'd just step through the orderly, predictable process with a minimum of tension. 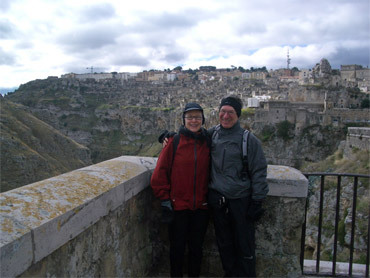 We had built-in 2, long intervals off the bikes for our 2007 touring season: our 10-day jet lag lay-over in Rome in early May and 3 weeks for hiking in the Italian Dolomites in July. Little did we know that we'd accumulate a string of non-biking days in addition these planned ones. There was no biking or hiking for Bill for the better part of a week at the end of July as he recovered from a difficult respiratory infection in the Alps. In August, there was the smaller layover in Villach, Austria coordinating Bill's long day trip by train to a suburb of Vienna to pick-up a new laptop battery. Then, we were off the road for 2 weeks at the beginning of September while we awaited the delivery of a bike part from the States to Opatija, Croatia. And in southern Croatia, we laid-over 4 days in a 10 day stretch to tend to a problem with Bill's bike and to sit out stormy weather. Our usual biking average is about 1000 kilometers or 600+ miles per month, but this season we only made that "kil-age" in a single month. A less enjoyable way to get that all-important exercise. Fortunately for my knees that benefit from bulky quad muscles, we did significantly improve our ability to maintain our fitness level for cycling during these planned and unplanned interruptions. In the summer of 2006 we initiated an exercise intensity focus to jumpstart Bill's weight loss program. His commitment to walking, hiking, and cycling with more consistent vigor paid-off as his fat trimming exceeded expectations based on his calorie cutting. Wanting to enjoy Via Ferrata hiking routes in the Dolomites both this year and last lent a new urgency to the intensity focus too, as our hiking speed was too pokey to get us to the cable cars that were a part of the route before they closed for the night. During this season's lay-offs, we capitalized on our lessons learned in 2006 by heightening our exercise intensity off the bikes. When doing daily hikes for 2 weeks in the Dolomites, we strived for big elevation gains on steep slopes, both for the better views and for the workout intensity. Working so hard at an infrequently done activity like hiking left us sore and deeply fatigued, but we were amazed when we took to the bikes after the 2 week cycling break as we'd lost little of our conditioning edge. Doing 1500-3000' elevation gain hikes every day on steep terrain mimicked the cycling motion closely enough to maintain the power we needed for climbing mountain passes on loaded bikes. With that experience in the Dolomites this year in mind, we looked for steep walking opportunities during our 11 day bus tour of Croatia while waiting for my bike parts to arrive. Such steep walks turned out to be hard to find but fortunately 6 of the 7 days before we got on the bikes again, we'd succeeded in finding steep outings, some involved hiking up 1500' in about an hour. Our conditioning from these walks wasn't quite as good as in the Dolomites, but good enough that we (and my knees) could perform well on our first riding days back on the road. This year's experience with more intense hiking also finally clarified why cycling and intense hiking are better sports for us than running. We clearly could spend more hours in a month in the high cardio-vascular conditioning range with cycling and hiking than we ever achieved with running. We jogged for years before taking up cycling and even completed 1 marathon, but we both always suffered lay-over forcing injuries several times a year, year after year when running. After each injury, we'd have to slowly build-up again, knowing that despite our best efforts at meticulous training, stretching and receiving massages, that we'd again be injured in a few months. Recurrent injuries aren't a problem for some runners, but they plagued us both for the 10+ years we ran. When we bought bikes about 15 years ago, I could immediately tell that cycling was kinder to my body than running and I easily dropped the running after overlapping the 2 sports for a year. Bill was more conflicted, but it was an easy decision for me. In 2007 we finally learned how to make walking/hiking an intense fitness activity, which not surprisingly, was the same as in cycling. The secret to success with both sports was simple: which is "do hills." And in both sports, the steeper the better. A short time of either activity on sustained 10-20% grades far outweighs the CV benefits gained from all day on flatter courses. Steep climbing on our feet or in the saddle gives us a workout we can do day after day without injury, unlike with running on less intense courses. It was a wetter year than usual, especially since the 7 month season favored the better weather months than our usual 10 month season. We didn't complain too loudly though because we soon realized that we were rarely getting the brunt of the European storms. We'd get rain; others around us would be flooding. 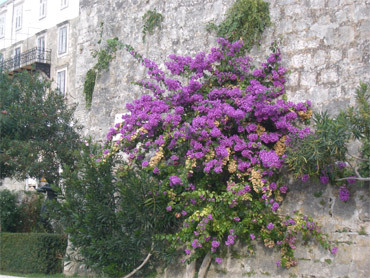 The rain did keep the flowers blooming in Croatia. And by chance, we were able to sit out more of the rain this year. In general, we had warmer weather when it rained so if we could find roadside shelter to wait out the downpours, we didn't get as chilled as we usually would. Several times in Germany and again in Croatia, the downpours coincided with finding a bus shelter or substantial eve. The protection from the wind and rain would allow us to read our books in relative comfort for a 20 to 30 minute interval. And unlike past years, we were often at or near an interesting place when the predicted rains arrived, so we just hunkered down for a couple of days. Countries on our route like Croatia and Italy more frequently offered interesting and comfortable lay-over towns than other countries we'd toured in previous years. We thought back to our autumn tours in Czech Republic where we'd elected to keep going in the foul weather, both because our unheated accommodations made it uninviting to linger inside during the day and because our host communities were often quite dreary. Though unpleasant, riding in the rain looked like the better option in those situations. This year was unusual for the apartment-styled living we more frequently enjoyed. Our 4 month winter interval in New Zealand provided us with many motel rooms with full kitchens and we often had that pleasure in Europe too. By design, our abode in Rome at the beginning of our trip was an apartment with a closet-sized kitchen. We also carefully shopped for an apartment with a complete kitchen for our 2 week hiking stay in Selva in the Italian Alps. And tourist apartments with kitchens were easy to come by in both Slovenia and Croatia. Usually when traveling in Europe, we will only have apartment-styled accommodations once a year but this year was different. Every extra element of a kitchen is a delight for us. Even a mini-bar refrigerator in a hotel room helps us in carrying a half a jar of pasta sauce over for a second night and keeps our veggies fresher in the warm weather. The extra sink that comes with having a kitchen is always welcome, as the competition for the bathroom sink is high each evening as we cook dinner, hand wash our clothes, and tend to our personal care. And cooking in regular pots and pans on a stove has some marked efficiencies over our single electric pot. Surprisingly, our simple cuisine doesn't change much with the addition of a kitchen, though our cooking efficiency does go up. Though our breakfasts did get a menu change with the appearance of the kitchens this season. We love having hot bulgur for breakfast and being able to heat up the canned beans and tomatoes that we add to it, but bulgur wasn't readily available in the regions where found kitchens. So, in the Dolomites we caved into the regional favorite and had hot polenta (cornmeal) for breakfast and topped it off with our beans and tomatoes. As we moved east to Slovenia and Croatia, kasha or buckwheat seemed the rage, so we had kasha. Kasha takes more time to cook than we want to spend in the kitchen in the morning, so we cooked it alongside our pasta in the evening and reheated it in the morning--something possible with both a stove and a refrigerator. It was a small thing, but it was a fun change in our menu. In addition to the kitchen, we always enjoyed the extra elbow room that usually came with the apartments. 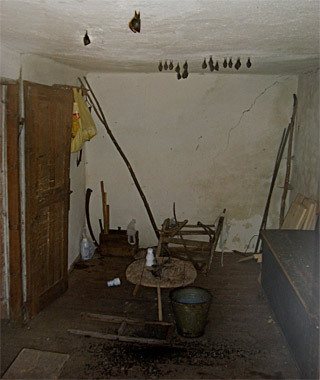 Bats: the real thing in Croatia. While our families have long referred to us as the "nuts & berries relatives" because we happily eat pounds of fresh produce each day, we nick-named ourselves the "fruit bats," and this was the year of the fruits bats. It started with a long strawberry season that began for us in Rome in May and continued into early July in Germany. Then it was a brief stint with the fresh cherries as we headed east. We hit a lean spell until we were back in Italy in October, but savored the cheap melons and persimmons through November. Consistently luscious pears of many varieties replaced less reliable apples at lunch for 2 months until we headed home in December when they briefly overlapped with persimmons. We missed the stone fruit season in Italy this year, which was a shame. They produce wonderful and inexpensive peaches, nectarines, and apricots but we weren't at the right place at the right time to buy endless 2 lb buckets of them. But this year was still a great fruit year as in some prior years we are too remote during the height of the growing season to participate in the abundance. Not too surprisingly, having cell phones this year was a pleasure. We'd tried in years past to have them in Europe but were excluded from the technology because of a lack of an EU address. But things have changed and it is now possible for foreigners to use European systems without a European address. Bill bought low-end, 4-band, unlocked phones for each of us in the States before heading to Europe. Then, in each of a half dozen countries, we bought domestic SIM cards for 1 or both phones, usually for $10-15 each. That often gave us reasonable rates on calls within the country. In Germany we were able to buy a separate SIM card for great rates on international calls too. Italy and Germany required paperwork to buy SIM cards. In Austria, Slovenia, and Croatia there was no paperwork--only swapping cash for a SIM card. Since we were buying a new SIM card and therefore acquiring a new cell phone number every time we crossed a border, the cell phones weren't a good way for folks from the States to call us. Travelers from abroad that remain in a single country could of course receive calls from home. Pressing business matters in October spurred Bill to re-explore using cell phones to connect to the internet--something he explored in May and rejected because of the cost. But it is a rapidly changing industry and by October there were new options available. He was able to rig up a slow connection that allowed us to up and down load emails, though wasn't cost or time effective for surfing. The ongoing business matters have him selecting new equipment to bring back with us in 2008 that may see us relying exclusively on cell phone services for our internet access. We are often asked if we encounter anti-Americanism while traveling abroad and our short answer has always been "No." But this year, we have to add a qualifier to our answer, which is "Not face-to-face, but we have online." In the past, our lone, blatant anti-Americanism experience had been with a Polish hostess speaking to Bill in German with glee about the 9/11 attack. She clearly felt it was high-time that Americans took their lumps with terrorism like the rest of the world. We've occasionally suspected being the victims of price-hiking, but have assumed that it was because we were tourists and not because of our nationality, as most people don't know where we are from. (We are often assumed to be German because of the bikes but this year in southern Italy I was asked if I was Polish and even more surprisingly, Japanese.) Shopping at supermarkets instead of roadside stands eliminates many of the opportunities for double standards in pricing, though we occasionally suspect we are incurring a "tourist tax" in other situations where prices aren't posted. We have however wondered if there was more anti-American sentiment out there than we experienced. Part of our reasoning has been from listening to many German tourists say they never experience anti-German sentiment and yet we've heard plenty of people tell us they hate the Germans and make life difficult for them if they can. If the German tourists weren't hearing or feeling the negativism, we wondered if we too might be missing it. An unpleasant, online experience in September of this year made it clear that there is a pile of pent-up hostility towards the US and that some people were quick to express it--if they could anonymously. An American climbing couple we met in Croatia highly recommended virtualtourist.com as an extremely helpful website. I signed up as a member and the same day posted a forum question about a particular European visa situation and mentioned that I was an American. Instantly I was getting hateful replies that offered but no help plenty of condemnation of me as an American tourist in Europe. Being one who tries to avoid being around grumpy people even in the grocery line, I was aghast to feel victimized like the town whipping boy. I quickly tried to delete the posting and was unable to remove or modify it. I eliminated the link to our website in hopes of stemming a possible tide of hate-mail there and pleaded for mercy from the management of the site. The virtualtourist.com site isn't set-up to allow access to the management, as users are suppose to get their help from other users, but looking to my peers for help had already backfired. I sent out a short, desperate email to the site manager anyway and quickly got a reply from the general manager. He too was impressed with the nastiness I triggered and promptly deleted the posting. He suggested that it was specifically the visa issue that was triggering such vehemence. Since 9/11, the US has made it increasingly hard for non-Americans to enter the country and a new rule announced in September would make it even harder in the future. The manager well could be right, that the visa issue was a hot button. But it was startling to us to directly experience how the internet has decreased personal accountability in interactions. I can imagine that the guys (I assume most were guys) that spend a lot of time gaming, sim-ing, and doing other quasi-interactive activities anonymously on the net have become too comfortable with too much blustery spontaneity and don't filter their reactions online in the same way that they do in face-to-face communications. It was an unsettlingly and mildly frightening experience for both of us to have so much mud flung at us. Presumably the sociologists are examining if the virtual world is distorting people's judgment in a way that affects how they manage themselves in the real world. We've generally try to keep a low profile as American travelers and were surprised that we need to do that online too. One of my failures in 2007 was the inability to capture our experience of ugly scenery in photos. Intermittent sights in southern Italy spurred me to try harder at this aspect of travel photography and I had little success. It looks like a poorly chosen subject, rather than boring scenery. 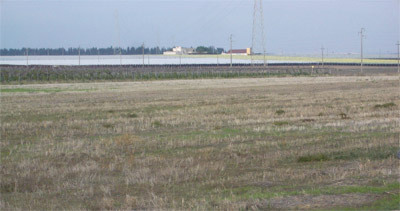 We saw dreadfully boring, flat, ugly land around Metaponto on the east coast of southern Italy. The flatness of it meant that for our eyes, like in a photo, that there was no subject to the scenery. There was no "foreground, mid-ground, and background" as exists in so many good outdoor shots. The scruffiness of the reclaimed swamp land merged into a sea of ragged brown vegetation. It was clear to our eyes and brains that it was dreary but photos of it left one asking "What's this of?" The answer was unsatisfying: "Nothing--because there was nothing there." "But why do you have a photo of it then?" "To show you, to show you how ugly it was." "But it looks like nothing." "That's the point." And on and on the endless explanation goes, like the endless, pointless scenery. We were overwhelmed by the creepiness of Taranto's old town, and yet capturing it in a photo proved difficult. We made various attempts with panoramas of the dilapidated port-side buildings, of partially abandoned back alleys, and of ragged looking buildings. But just like the flat-terrain photos of the reclaimed swamp land, we found ourselves asking "What's that a picture of anyway?" when looking at the clip. We found ourselves asking: "Where's the other photo?" The town's features that made it creepy, like the blackness of the alleys on the sunny day and the narrowness, are also what made them hard to photograph: there was too little light and no interesting vantage point. At this point, we are left to assume that our brains are programmed to expect something dramatic in a photo, either stunning scenery, powerful emotions on faces, or dramatic details or shapes. When the brain sees a dull, uninteresting subject in a photo, it assumes something is missing, that it was a mistake. It seems that our brains can't handle "Look, look closely, see how there is nothing to see" as a worthy pictorial story. At least that is the state of our understanding of the problem at this point. We'll find out together if Bill and I can master the art of capturing the experience of "boring and ugly" in photos in 2008. It could have been worse. It wasn't raining, it was about noon, and it was an unloaded day ride. The bad news was that neither of us had brought the special little tool needed to remove Bill's rear wheel for the repair. He had bought exotic skewers (little axel rods that hold the wheels in place) that use a unique tool to prevent skewer theft--one of the dirty little secrets in the biking world that we were victims of in the States. We were traveling so light for the day ride that neither thought to bring the wrench. We'd gone 1 to 2 years at a time without a single flat, so a sudden blow-out is not at the top of our list of day ride problems. Resourceful Bill learned a new trick that day, which was how to patch a puncture without removing the wheel from the bike. That was the good news about the "catastrophic failure." This was no little, practically microscopic puncture from some insidious, long-gone bit of glass or wire. No, Bill had a inch long rip in his pricey, heavy duty tire--it just tore open like his rims had done in the past. The ultra-heavy duty inner tube was protruding through the tear onto the pavement and finally wore through under the abuse. A big patch on the inner tube and a thick wad of heavy-duty, scrap inner tube folded in half and placed between the tube and the tire as a "boot" allowed Bill to ride home that day. On the way, he coaxed a woman into reopening her hardware store so he could buy a $10 tire. His exotic bike was slowly being downgraded: earlier in the riding season his fancy saddle snapped and was replaced by the most expensive one available, a $15 model; now his rear tire was next to degrade his fine machine. But he was content to ride out the last month of the season with an under-engineered tire--that is until he got a flat from the tiniest little puncture 4 days later. Another first occurred with this second flat. This time we were fully loaded so we both had our special little tools, which was a good thing. The tiny puncture in the tube with no sign of an entry point in the tire left us unable to make a repair on the road as we couldn't find the hole, even with taking the wheel completely off the bike as is the usual practice. Plan B was implemented, which was to pull out the spare tube and use it instead. The punctured tube would repaired that night when we could immerse it in a sink of water looking for a trail of air bubbles streaming out from a tiny puncture, which is the classical remedy for punctures playing "hide-and-seek." Bill gave the spare tube a preliminary spurt of air, put it in the tire, and started pumping away. But the tube didn't inflate. After fiddling with the pump-valve connection several times, he removed the spare tube. With a new sense of urgency, Bill was finally able to find the puncture--at about the same time that I had located the unlikely find of a sink with running water just inside a vendor's unattended shop. My moment of heroism in finding a sink for the submersion test was dashed however, and we proceeded with the now uneventful patching job. As our thoughts turned towards being back in the States, one of the questions I anticipated being asked is "Why do you keep traveling in Europe when the US dollar is so terribly weak?" The answer to that question, like so many, is swayed by context. Indeed, the dollar is the weakest it's been since we started traveling in 2001. Then it was about $.85 to 1 €; in November of 2007, the ratio was flipped to about $1.45 to 1€. The current rate is definitely atrocious but one that the analysts were predicting to hit earlier, in 2006. The cost of travel in Europe for Americans has done nothing but spiral upwards in these 7 years we've been touring, so if we had bailed out waiting for better rates at any given point, we'd still be waiting. That fact makes the decision in the moment to keep traveling look foolish but the same decision about the past look wise. The other factor that gives us courage to make the decision to keep traveling is the 'in your face' reminders of how short and unpredictable life is. This year alone we've had 4 friends diagnosed with cancer and 2 colleagues about our age died, 1 suddenly, the other was an anticipated death from cancer. Those harsh realities combined with our own growing inventory of age-related shortcomings remind us that the cash isn't necessarily the scarcest resource for travelers. The value of the dollar aside, we periodically have brief discussions about how long to continue traveling by bike. The discussions are getting shorter each time as our reasoning is becoming more tightly aligned. When we began as cyclotourists, the goal was to balance some serious traveling with good quality exercise along the way. In the first year we did less sightseeing off the bike than we do now, but we were also clear then as we are now that we were travelers first and cyclists second. Some cyclotourists routinely do double the daily mileage we produce and we never had aspirations to be in that league. It's an easy decision: we'll keep on traveling. But over the years our philosophy has consolidated along a broader model and that is one of healthy aging. Many experts agree that maintaining one's well being is best achieved by tending to 3 sources of stimulation: physical, intellectual, and social. Our traveling life does the first 2 quite well, as we get plenty of exercise, both from pedaling and muscling the loaded bikes and luggage around most days of the week. And we are quite satisfied with the intellectual stimulation we receive. We watch several DVD lecture series on our laptop each year, actively study languages, study regional history, and do some research for the webpage. It seems that both the physical and intellectual stimulation levels we get as travelers come at higher levels with less effort than if we were living a settled life back home. Here it just happens as a reaction to the circumstance, at home we'd have to be more self-initiating with both. The social stimulation category is the weakest for us as travelers, as what is generally associated with greatest mental health is having a variety of deep connections. We are intentional about nurturing our relationships at home but we can't possibly do as well with them when we are out of the country as when we are home. We do however work at improving our social skills while traveling, hoping that those efforts will pay dividends in the future when we stop traveling. So, each time the "should we or shouldn't we" keep traveling rolls around, it is the ready access to exercise with ever-changing scenery that tips the balance right away. Achieving our goal of spending 2 hours exercising most every day comes with the itinerary--we don't have to recite the pep talk of why it is the right thing to do. Were we settled, the internal resistance to "just do it" would be greater and the weather and choice of activities less inviting. So, obviously, the decision has been made to pedal abroad for another season. Map Man is more unsettled about the route than usual. Hiking in the Dolomites, exploring more of the Pyrenees, picking up missed sights in Spain, and seeing the rest of Sicily are all on the list, as is a jet lag layover in Tunisia in February at the beginning of the season. Fitting it altogether with the weather and avoiding high-season summer rates is the challenge. But this is the kind of uncertainty that we are accustomed to, so we'll let it unfold without accumulating any stress. We are about half way through our 10 week stay back in the wet, windy, and chilly Pacific Northwest. In addition to the essential chores, we've been busy digging deeper into our "other" lives, both our household business affairs and into our stored belongings. Being back home is usually chaotic and this time we are diverting more energy into projects that will make future stays less stressful. So far, we've been more successful than in prior years in keeping up our fitness level while at home, which is largely due to the "realignment" in our thinking about walking for fitness and transportation. And searching out opportunities for exercise intensity ("Where are those hills?") is also helping to maintain our conditioning. Our next update should be during or shortly after our visit to Tunisia, so stay-tuned for that adventure.